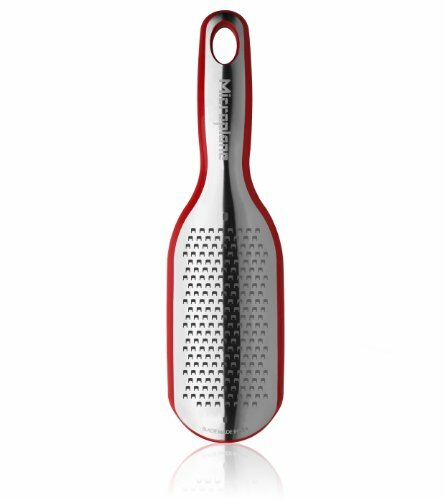 The new Microplane Elite Series red coarse grater can tackle a host of ingredients, including soft cheese like mozzarella, as well as medium-hard cheeses, like cheddar, provolone, and Swiss. With its 18/8 stainless steel blade, it's great at making beautiful slaw from cabbage, and quickly grating root vegetables like potatoes, onions, and carrots for salads, casseroles, meatloaf, and more. You can also use the coarse blade style to grate cold butter for pastries, and easily grate fresh coconut for garnishing cakes. Unique to Microplane graters, the new Elite Series includes a transparent cover that doubles as a grating catch feature and measuring cup. Made in the USA, this grater has a one year manufacturer's warranty and a loop for convenient hanging storage. If you have any questions about this product by Microplane, contact us by completing and submitting the form below. If you are looking for a specif part number, please include it with your message.